With big budget games getting larger and more bombastic, the smaller titles can provide an experience against the grain. In Rain, there’s no shooting, only traversing your surroundings and enjoying the atmosphere it creates. You play a little boy that wakes up in the middle of the night and finds a portal to another world. Inside this world there is a city that looks similar to Paris, where it is always raining. When you walk through the portal and enter the city, you are no longer visible. This is your advantage against the ghostly figures that are seeking you and will kill you when seen. During the duration of the game, your silhouette shows when you are standing out in the rain. You also have to look out for puddles of mud or water as they will both show the monsters where you are by your footsteps showing on the ground. Without spoiling the story, it revolves around you and a little girl, who you run into in the world. The story and the charm of the game are its strengths. The soundtrack is also a standout. The gameplay is a unique twist on the stealth genre; however I never felt it wasn’t fully fleshed out. The game could have done more with the stealth mechanics or offered different types of monsters to avoid. 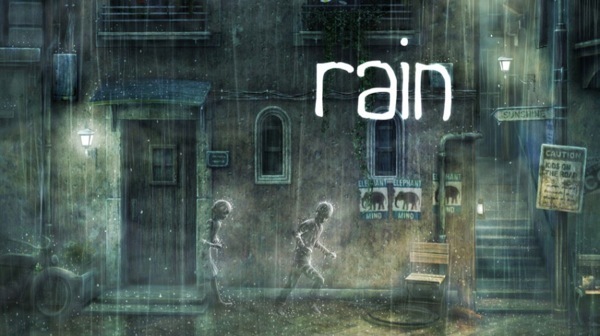 I find games like Rain are the perfect palate cleanser to large mega-budget games that we are flooded with at this time of year. I thirst for the shorter, more thoughtful experiences. Journey and Walking Dead were that for me last year and although Rain doesn’t reach those heights, I did enjoy the experience enough to recommend.